Read our free thank you letter sample template to effectively voice your appreciation for the contribution that a team member, client or other associate has made. As the leader, you can't thank your clients and team members enough! Highly effective leaders realize that it's never difficult to find a great reason to say, 'Thank You'. Great leader's express their gratitude every chance they can. Two little words that when put together and spoken aloud are two of the most important words in the English language. How simple it is to say, or write, 'Thank You', yet so many times we miss the perfect opportunity to do so. Saying thank you is a quick and easy way to make friends and solidify relationships. Whether personal or professional, sending a thank you note always scores big points with the recipient. After all, who doesn't like to hear that they are appreciated? Our thank you letter sample template will assist you in saying thanks in a manner that is meaningful and effective. Opportunities are plentiful! For instance, you can thank someone for their time; for making an extended effort; for going the extra mile; for completing an important project; for accepting a new position or responsibility; for helping in someone's absence; for volunteering their time or money; for participating fully in a meeting or for just bringing up a particularly helpful idea or solution. Praising your employee and saying thank you in public is especially meaningful since you are telling not only the individual, but the entire team how much you appreciate this person. "People who produce great results, increase their self-confidence and feel great about their accomplishments. However, don't thank people for activity alone, thank them for results." When you praise an employee in front of the team, this can be an effective way to let your entire team know what behaviors and performance levels you expect and are looking for in everyone. Leaders who make the effort to say thank you on a regular basis tend to be leaders who are highly respected. Saying thank you shows others you care and that you appreciate what they bring to the team. Gratitude for others promotes a healthier work environment and promotes positive habits throughout the workplace. Below you will find our top five tips for writing effective thank you letters. 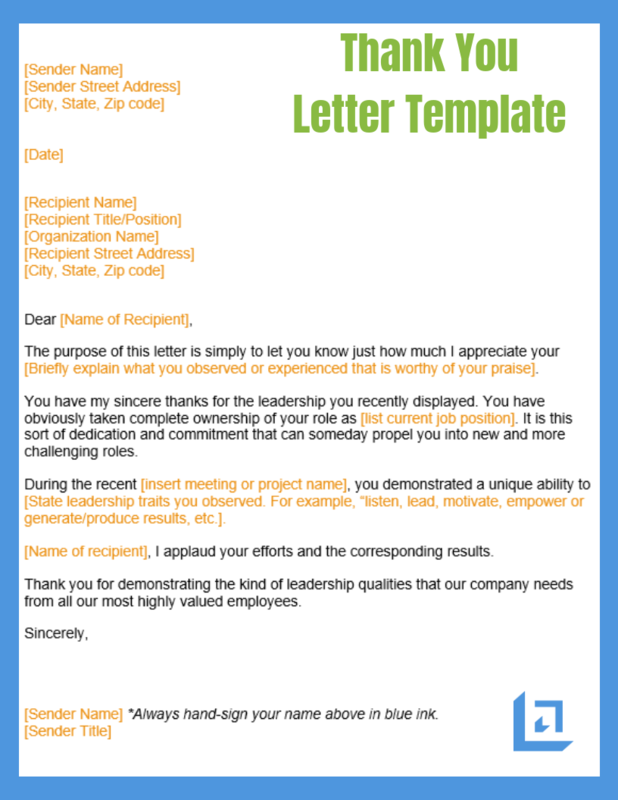 These tips are utilized in our free thank you letter sample template. Hand write your thank you note or letter for maximum impact. Be sincere in your praise without going overboard with too much dramatic flair. Stay on message - do not deviate from your intended message. Maintain the purity of your thank you letter by keeping your comments focused on the reason for the praise. 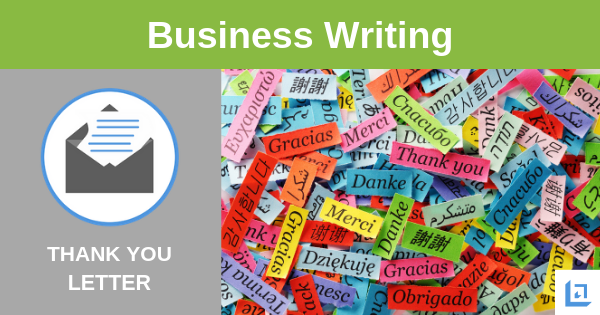 Avoid any perception of using a form letter, make it personal. Be timely. Thank you letters or notes should be sent immediately following the event or circumstance. The more time in between, the less effective the thank you letter will be. Avoid using traditional corporate stationary. This tends to be perceived as cold and uncaring. Choose a card or stationary that is easily customized to the situation you are recognizing. Proofread your thank you note or letter before sending it. Avoid making spelling or grammatical errors. Shown below is an image of our thank you letter sample. Use this free template to express your heartfelt gratitude to an employee or customer that you wish to recognize for their loyalty or key contributions. To download our free Business Writing Templates/eBook, complete with the above free thank you letter sample, plus templates for many other topics, simply subscribe to our free newsletter. You will immediately receive a password that grants access to our entire leadership tools library.